Yummy Tai Chi was a small Chinese restaurant in Northwood Hills, another refugee from Oriental City (where they were called Yummy Yummy Thai). It closed some time around the end of 2009, and as of March 2010 there's no indication of what's happening to the site; the Yummy Tai Chi sign is still up, but the shutters are down. According to a comment on Flickr, the people behind the business intended to move on to run a juice bar in Pacific Plaza, but as of spring 2011 Pacific Plaza has closed too. Small Chinese restaurant in Northwood Hills, another refugee from Oriental City (where they were called Yummy Yummy Thai). 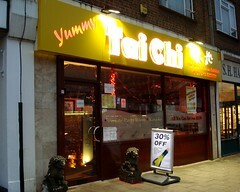 They also offer takeaway and delivery. Kake and a couple of friends visited on a Thursday evening in March 2009. The place was pretty much empty, and remained so throughout our visit — a shame, since it's really pretty decent. Although they offer an all-you-can-eat deal, which allows you to order as many freshly-cooked dishes as you like for £13.90/head (£14.90 on Fridays and Saturdays), we decided to go a la carte. We started with crispy seaweed, mock chicken satay, and spicy salt and pepper tofu. It was all fine, but the mock chicken satay was particularly good, with an interesting coconut flavour in the batter and a good texture. We all agreed we'd certainly order it again. For mains, we shared spicy garlic aubergine (very good, with the aubergine soft but not overly oily), Szechuan chilli squid (not bad, a little chewy but then squid often is), and roast pork in black bean sauce. We accompanied this with a couple of portions of steamed rice and a couple of bottles of white wine chosen from a decent enough wine list (though they didn't have any of our first choice chilled, we chose another which was fine). Service was friendly and personable. Unfortunately the background music was kind of cheesy, which was a little annoying at times. The lighting was also a bit weird, since we were sitting near the front window, which has flashing lights in it. Overall though, this is a perfectly pleasant little restaurant. It's not the place to come for obscure authentic regional dishes — the menu is firmly grounded in "standard British Chinese restaurant" — but what it does, it does very well. Vegetarians would also be quite happy here, with plenty of tofu, mock chicken, and vegetable dishes on offer. Our final bill was £20/head, which is very good value given we had two bottles of decent wine. Accessibility: Level access to get in and to get to the toilets. Last visited by Kake and friends, 12 March 2009. Opening hours taken from takeaway menu, March 2009, and updated from post on the Yummy Tai Chi blog, May 2009. Last edited 2011-06-02 16:45:09 (version 10; diff). List all versions. Page last edited 2011-06-02 16:45:09 (version 10).